Info "Shrimp on the menu tonight!" Fried Shrimp, known as Fried Prawns in Europe, is a downloadable microgame in WarioWare: D.I.Y. and WarioWare: D.I.Y. Showcase. It was released on September 30, 2009 in Japan, August 30, 2010 in North America, and October 1, 2010 in Europe. At the start of the game, the player is presented with uncooked shrimp. The game will automatically drop the shrimp into the cooking oil. 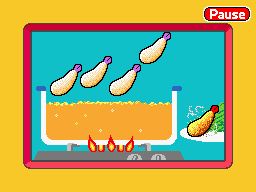 The player is tasked with tapping the shrimp, but only if they are cooked like the shrimp on the right of the screen. All four shrimp need to be cooked properly for the game to be won. The shrimp burn at the very end of the game if the player isn't fast enough. This page was last edited on March 19, 2019, at 16:13.